The synod on marriage and family has released its final report. You can read it by clicking here, though, so far, it has only been released in Italian. (Try Google Translate or another translation program.) The passages on lesbian and gay issues are numbers 55 and 56. The synod’s final report significantly backtracks on LGBT issues from the draft released earlier this week, but the synod’s process and openness to discussion provides hope for further development down the road, particularly at next year’s synod, where the make-up of the participants will be larger and more diverse, including many more pastorally-oriented bishops. It’s very disappointing that the Synod’s final report did not retain the gracious welcome to lesbian and gay people that the draft of the report included. Instead, the bishops have taken a narrow view of pastoral care by defining it simply as opposition to marriage for same-gender couples. Additionally, their further comment about supposed “international pressure” to accept same-gender marriage selfishly views the hierarchy as the victims, not LGBT people who receive unjust and oppressive treatment by governments, church, families, and society. Pastoral care should focus on for LGBT people as total human beings, many of whom have suffered significant alienation and personal harm, and not just as sexual beings. Pastoral care should also focus on the gifts that LGBT people bring to the Church, something that the earlier draft highlighted. One major error the bishops made in the final report was to quote the Vatican’s 2003 document condemning same-gender marriage, which referred to adoption by gay and lesbian couples as a form of “violence” toward the children. Such language is pastorally harmful and destructive to any welcome to lesbian and gay people. It’s important, however, to keep two things in mind. First, the paragraphs on homosexuality which did not receive the required 2/3rds vote, and which were more welcoming of LGBT people, failed by only a handful of votes, indicating significant support from a majority of bishops. Second, this report is not the final word, but as a Vatican spokesperson explained, it is still a working document which will be discussed in the coming year. What was good about this two-week long meeting? The real value of this synod is that it has started the discussion among the hierarchy on LGBT issues which has been going on for decades among the lay people and theologians in the Church. The bishops began to catch up, and I don’t think that the discussion will stop here, but will only continue, with more promising outcomes for LGBT people and their families in the future. It is not surprising that the paragraphs on lesbian and gay people proved to be among the most controversial of the synod’s proceedings. The paragraphs on homosexuality were among those that received the lowest affirmative votes. This result shows that there is still much to be examined and explored on LGBT issues in the Church. Let’s hope and pray that at next year’s synod, the bishops will invite lesbian and gay people and couples to give their personal testimonies, so that the bishops can learn first-hand about their experiences of faith and love. More importantly, though this synod revealed that there are some strong voices for LGBT equality and for change in church teaching, something which was not known clearly before the meeting. Now that these voices have been bold enough to speak, more bishops who think like them will surely follow their example. The biggest problem in the Church up to this point has not been lack of support among the hierarchy on LGBT issues, but lack of courage for those bishops to speak out what they truly think. The silence has ended. Nothing will be the same. Between now and next year’s synod, the discussion in the Catholic Church–at all levels–on LGBT issues, as well as other issues of family and sexuality, will be more open and robust than it has ever been. That is a very good thing! New Ways Ministry is a 37-year old national Catholic ministry of justice and reconciliation for LGBT people and the wider Church. Ever the optimist, which is good, but a sad commentary on how hard recognition and compassion continues to be. How sad and crazy. Maybe somebody can explain to me why the pope can’t just tell everyone to grow up and knock it off so to speak? What is all this bishop nonsense? How ridiculous. But the good news is, most people do not take the Vatican seriously anyway. In another 25 years they will be obsolete. The “sick” way with which the bishops reversed the anticipated openness of the Church to gays will be translated in the same tradition way we, liberal Catholics have approached the archaic teachings of the past. The whole edifice of Moral Theology meant nothing to too many of us, all over the world. We will continue to ignore the Christless utterances of Synods and Magisterium and follow our own consciences with regard to accepting gays, married gays, gay adoption, divorce…etc. The second important factor to consider, in addition to ignoring the conclusions of the senile Synod, is the plan to STARVE YOUR BISHOP campaign. Hit them where it hurts and let them know why you are punishing them. I have done that in the past and wrote to the bishop about it. Fantastic statement and suggestions, Sean. Perhaps a “New Reformation” is what’s required — and it will be all the more powerful as it takes place among younger Catholics, who wish to remain Catholic, but who have no use whatsoever for the retrograde social bigotry of the aging “Red Beanie” crowd. See my follow-up post at the bottom of this message queue. I have stopped supporting my homophobic parish and instead give my $$ to NETWORK, a Catholic social justice organization run by the wonderful nuns. I have also kept a few $20 bills in my purse and try to give one as things emerge: a kid collecting for education, a waitress who is cheerful despite low wages, the homeless. This feels right to me. I have let my parish priest know what I am doing and why. They need to know. Also, if I am ever at mass, and become aware that a LGBT person is being denied communion, I will break my host in half and offer it to that person, as I am required to to by Jesus Christ. All are welcome at the table of the Lord. The communicant is responsible for his/her own conscience formation through reflection, prayer, and reconciliation. We must each be the church Jesus requires us to be. We are the church. It is our responsibility. Acts worthy of a true Christian — feed my people followed as Christ meant it to be. Don’t you get tired? And when they finally get around [next year… the year after..? ?…the year after never?] to actually saying something positive about gay people it will most likely be watered down and with language that canon lawyers have parsed to death. Do as Sean says, ignore the bishops and as I say, head for the doors to a church where you don’t have to fight tooth and nail and beg just to be talked nice to. Yeah Larry — you are right. Sad to say. Sexual abuse scandals just got a halfway decent apology and it too Francis to do it decades later. So….the majority of these bishops (some exceptions obviously) are sick, ignorant and arrogant people you can’t reason with. I am thinking you and Sister Jeannine must be exhausted and exhilarated at the same time. How very important you are to all of us! Yep, but changing the caring statement about homosexuals to the present one is condescending, I think and pretty outrageous. Our only hope is the Pope. As usual with these red-beanied characters: “Two steps forward, six steps back”! What they fail to recognize is that their retrograde social opinions are totally irrelevant to 80% of our practicing young Catholics under the age of 25 — as exemplified by the GLBT-accepting attitudes of the Catholic students at the major state university where I’m based. And I expect that the statistics are similar at ALL major colleges and universities, both Catholic and secular, in the Western world. Do the demographic profile, and do the math. Sexual bigotry has NO FUTURE in the Catholic Church. These Cardinals simply refuse to face the social reality that’s staring them in the face. It is time for new ways ministry and dignity to knock the sand and dirt of the fight for righteous acceptance in the Roman Catholic Church from your own sandals and realize, a true better church awaits you in the Episcopal Church which doesn’t hesitate to accept LGBT persons as true christians and is a true model of the Reign of God here on earth, let the RC Church ask for atonement for its hideous persecution of LGBT persons for the last 30 years and come to accept where the Holy Spirit is leading the Church today. Thanks for the suggestion. I realize that joining the Episcopal Church is an option for some people. But it is not for everybody. I still feel called to remain a Roman Catholic, even if that means continuing to work for justice for LGBT people. 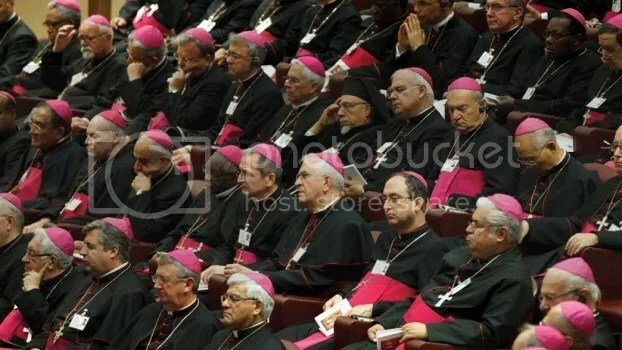 Let’s be realistic…look at the above picture of the Synod attendees…..all old men….many of these old supposedly heterosexual white male bishops and cardinals are going to have to pass on and be replaced with Pope Francis’ choices before LGBT people are going to be “welcomed” into the Church with any modicum of dignity or respect….most of them came into power under JPII and Benedict…Cardinal Burke’s dismissal last year from the Congregation that chooses new bishops was the best first step in this process…change will come when the conservative bishops and cardinals become a minority within the hierarchy….and the obvious – the present corrupt system of an all male all powerful priestly clerical class will only change when women are finally allowed to be ordained and take their place beside their brothers as priests of the people of God…..
Yup, totally. Well said Michael. So if I understand this correctly, the final official language WAS approved by 2/3’s ++ of the synod. Did the “pro-gay” faction that wanted the more progressive language just give up? They don’t seem to have the strength of their convictions. And yet……you want to wait a year with hopeful crumbs coming from this or that bishop or retired cardinal and in the end the synod will wiffle/waffle on the issue and go back to the same old same old. When is the next time this comes up? Never in our lifetimes. It is clear we are being played by a hierarchy who is mostly deaf dumb and blind to the real lives we live. Head for the doors folks. It is a shame that those entrenched in red do not have half the courage as those they choose to ostracize! Pray for their hearts of stone to be touched by the love of our God and our Pope. SYNOD: We're Almost to the End, But Not Quite Yet And Yet . . .